I have wanted to make mittens for quite some time. My first thought was knitted mittens using some of the handspun yarn, I have stashed away. But, knitted mittens sound challenging, and I already have enough knitting projects on the needles. I decided to sew, instead of knit a pair. We just "restored" a vintage Dressmaker sewing machine that was given to me and it was in need of a "test run". Have you seen the sweater mittens? I have seen them at Fiber Fairs, craft shows, and Pinterest. I loved the look! Perfect project for that bin of felted wool sweaters. If you don't have any, thrift stores are a great place to find them. They need to be at least 70 percent wool. 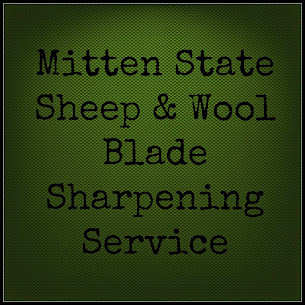 (100 percent wool works best). To felt them (shrink) just wash them in hot water cycle. 2 washes is usually all that is needed. 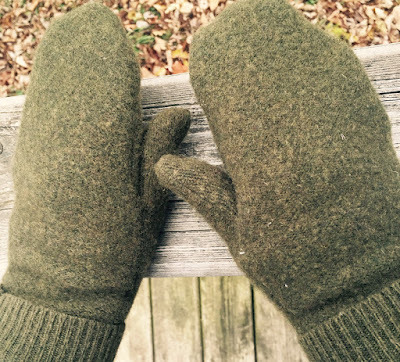 Most tutorials use the same method to make the mittens. I traced a larger pattern for the next pair, so I could add a lining. **There are other free patterns to use, if you do an online search. 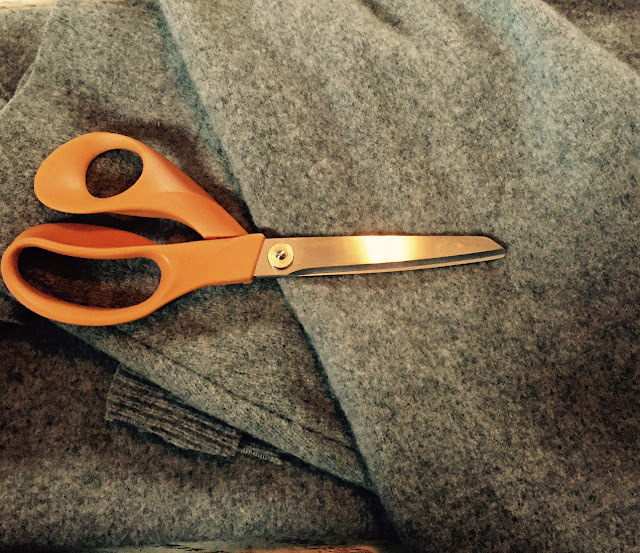 If you use the pattern from Hobby Farms, plan on making it larger if you want to have a lining in the mittens. I know my way around a sewing machine, but I am far from a seamstress. This is an easy, fun project, that takes less than one hour. You can add embroidery, buttons, use different sweater patterns for front and back to make quite a variety of mittens. The daughter I made these for, wanted plain and simple. 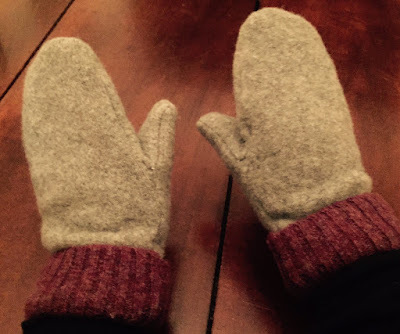 These are the warmest, coziest mittens I have ever tried on! I will definitely be making me a pair. What cute mittens and a very practical way to use a felted sweater! Love the idea of not having to knit them, too. Mittens are not my favorite thing to knit - off to get the pattern at Hobby Farms. Thank you for sharing. Oh my, who wouldn't love those mittens! Another project to look forward to trying! Thanks for sharing! Those mittens sure would feel good on a cold winters day! My GF makes purses out of old felted sweaters. I will have to show her these! Those look so warm. Very nice! I love the look of these, and have been wanting to make them for a couple of years. It's just hard to remember to look for wool sweaters when I'm in the thrift stores. Pinning you post though, maybe it'll help me remember? Thanks for sharing on the Homestead Blog Hop! Wow, I love this idea and the rustic charming look! Do you think this would work with an Hudson's bay wool blanket or would I need to add elastic? I think the wool blanket would work but you would have to add a band (sweater) or elastic to the bottom.